Sharp-aX customers are busy. They do not always have spare resource to implement a new computer system. We are conscious of the need to work with their staff to ensure a smooth flow of structured training, working around workload commitments. We recommend a phased implementation. The start of your initial training is the Implementation day when we identify how your business operates, the processes that you have in place and which processes you are looking to change and improve. 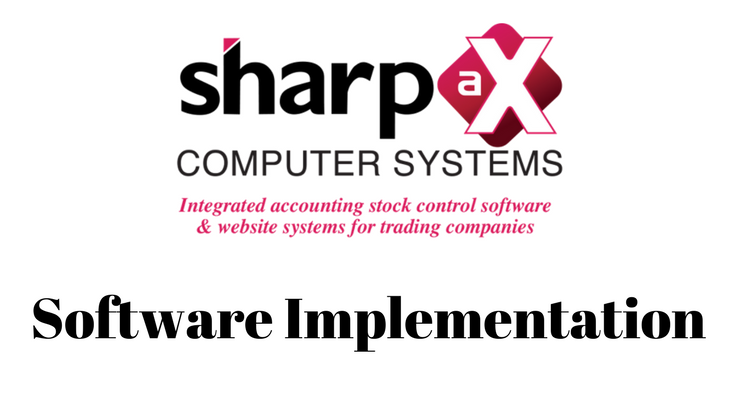 We will offer our recommendations drawn from Sharp-aX knowledge and a wealth of experience gained from other Sharp-aX system users over many years. We will agree a schedule of who does what, when and where for both Sharp-aX and your company in order to meet your go live target without unnecessary stress. The purpose of Phase Two is to get your staff trained and competent to go live with confidence. This means they will be knowledgeable on all ledgers, confident in sales and purchase order processing, goods in, returns, credits, cash collection and stock control. Each training day will have an agenda with nominated personnel to be trained. We recommend that some of the training be given at Berkhamsted to avoid interruptions and allow total focus on new tasks. The day is recorded and signed off by you – the customer – with a section for your comments and feedback which we welcome. Accounts people will be shown how to run financial reports/management accounting and VAT returns, transfer funds from bank account to bank account and to reconcile bank statements. Training works best in small numbers and in 2/3 hour slots, allowing practise between sessions and different departments to be trained throughout the day. We will review your processes and advise further improvements as appropriate. Once live, your data will become meaningful and make sales and purchases reporting invaluable to you, day to day and month to month, seeing trends in the form of Pivot tables and dashboards. We will visit each department checking for areas which could operate more smoothly and reminding about alternative methods. We have a team of software Developers whose job it is to write new features and modules, keeping your software up to date and always ahead of your competition. Your company should now be in a position to grow. You are now running your system with ease and your people are more efficient and happy. Now to look at additional modules such as: Sales-i , Marketing, Telesales, Van Routing, Bill of Materials & Works Order and Batch Tracking. This is the time to set up your fully integrated website. Come and visit us and see all the available options from B2B, Magento and our fully integrated website. When you arrive each morning, your system will have automatically downloaded new orders. These are the orders which you may not have received without a website.